It has been an emotional weekend as we all witnessed the sad events that have and continue to take place, not only in France but all over the world. Sometimes working from home makes me feel isolated from the outside, as though I live in a little bubble. But when I finally tune into the outside world, I wish I could just stay in my little safe haven and not hear of the hatred and intolerance that is going on out there. But alas, we live in this world and the sorrow and pain of others also becomes our pain and sorrow. Today, I wanted to bring a little joy to the my small corner of the world as I join my dear friend Kristen from Ella Claire and 18 other friends to share some gorgeous FREE Christmas time printables. 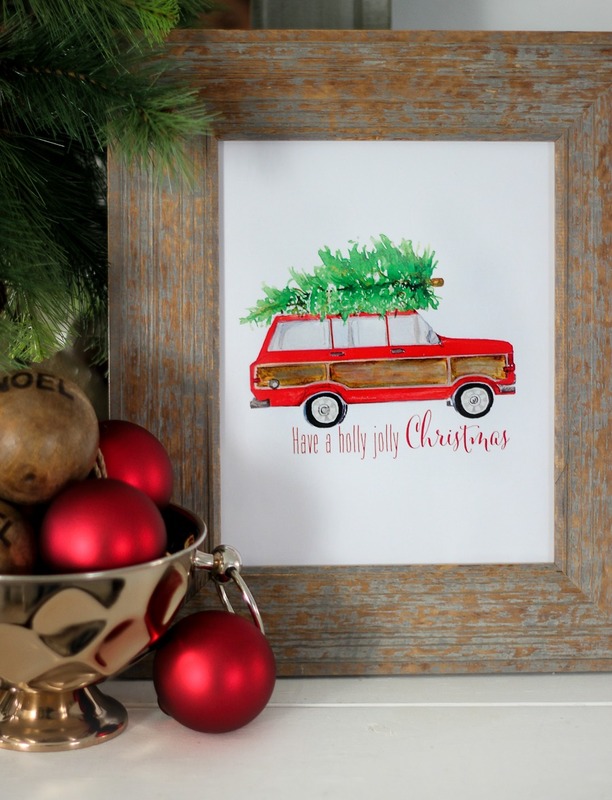 In preparation for this year’s free printable hop, I took a little poll on my FB page, and this Wagoneer received the most votes. I hope you like it! I also received a couple of requests from my coastal friends, asking for a little coastal Christmas, and so…. 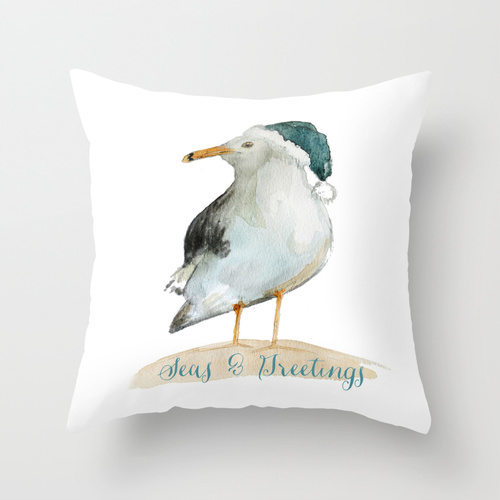 These two fun and whimsical seagulls are also available for you to download HERE. I have also uploaded them to my Society6 shop in case you want to take advantage of the one day only FREE shipping that is currently on (expires Nov 16 @ 11:59pm PST). I’ve mentioned before how I enjoy offering free printables and hope you like them too, however, I have also been very hesitant to share these lately as I have found my work being used for profit without my knowledge. It is truly disheartening when you see your work being passed as someone else’s. Art is such a personal and deep part of an artist’s soul and when someone “takes” it from you, it hurts. So please remember – these are intended for personal use only. If you would like to share, please share this post or direct people to this post. Thank you so much for understanding. And please don’t forget to visit my friend’s amazing printables below! So pretty. Thank you for creating beautiful art for us to enjoy in our home. I started to Christmas-fy our house yesterday. I know it’s early, but it’s still in the low 90’s here! Thank you Lucy! I appreciate your gifts … and am so sorry that someone decided to steal your work. I’m off to visit some other links. Thank you again! Thank you for the free printable’s. Free is always good and I’ll take as many free things as I can get. However, I don’t have a printer so I won’t be able to use them until I get a new one or get the one that I have fixed. I can’t believe someone would use your things and pass them off as something they did, but wait, I do believe it. Why should you do something yourself when you can use someone else’s things and get all the glory? I would never do that. If I use something from someone, I ask permission first. My sister is letting me use the photos she took that she has made into a calendar for my greeting cards as long as I write on the back that she took the photos. It’s a win/win for both of us. 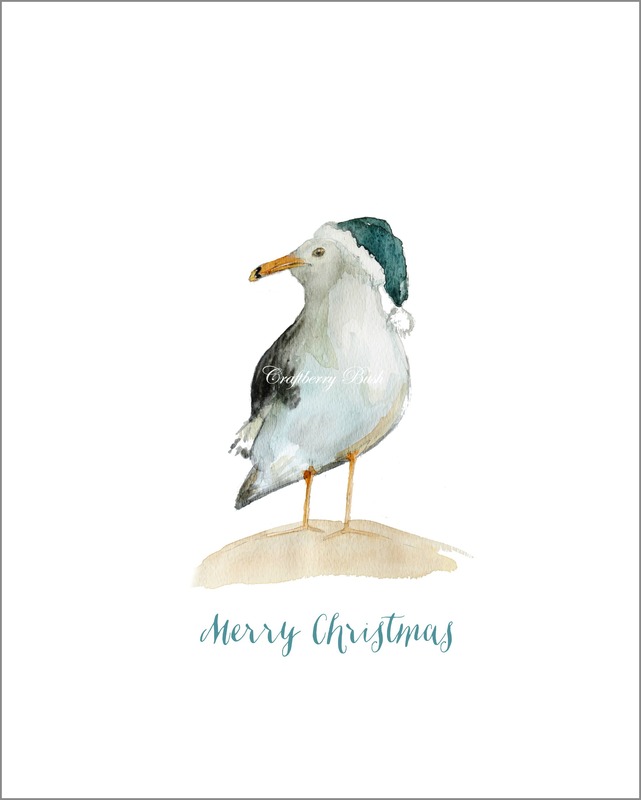 I get to make some beautiful cards and someone will look at the back of the card, see that she took it, and go to her web site and purchase something she made with her photography. Thank you again for the really fun freebies! This is so awesome. 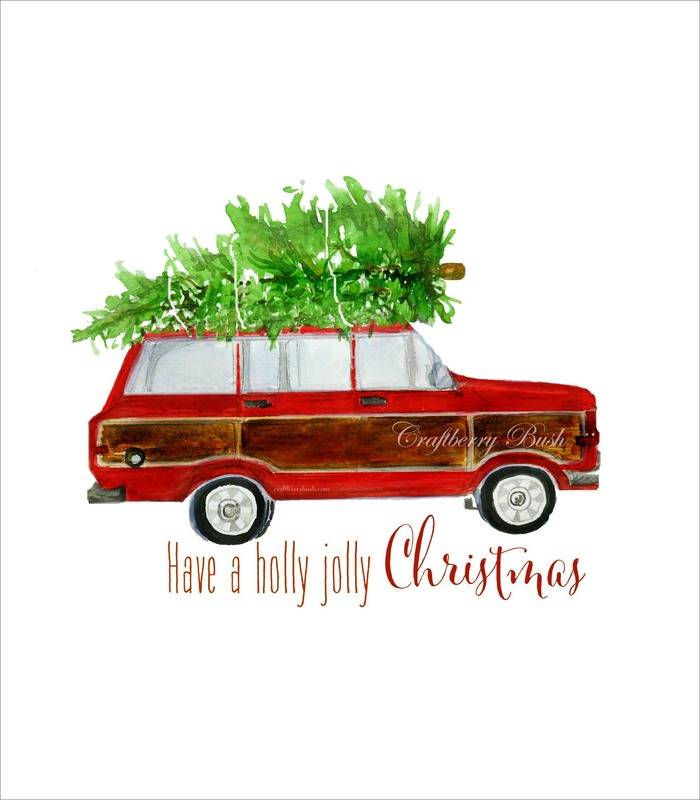 I just love all your trucks and cars, especially with Christmas tress. I am so excited. I bought my daughter a pillow with the vw bug and surfboard and she loves it. She says you need to do a VW van and a surfboard, or Christmas tree. Thanks you so much for these. Thankyou for both of the of the printables for the holidays. Your work is so well done and brings a smile to my face. It has been difficult to watch the news so thanks for bringing a bright spot into my day through your art. Have a wonderful day. They are beautiful, thank you for sharing! Yes, so difficult to see what is going on around us, so very sad, I’m sorry that you are dealing with your art being used for profit, seems like it is happening more and more 🙁 Wishing you a bright day! Thank you for an absolutely beautiful blog. You are so talented ! So sorry people are not respectful and misuse your generosity in offering the free printables. Just want you to know for whatever reason I can never print them. Sorry to hear about the abuse you got…. I truly wish these people would have the decency to give you credit, if not, proper compensation for your work. We appreciate all your beautiful art and admire more how much you want to share it for FREE! Credit should be given to you at all times, and I will for sure too, always! I saw one that Jennifer (Dimples and Tangles) had from a previous year…. and found you from her! Thanks so much! I adore your work! These are just beautiful, Thank you so much for your kindness in sharing them. I hope you have a magical Christmas. Thank you for sharing your time and talents. They are beautiful! Help! I am trying to purchase the Sea Greeting pullow cover! First time on site. Form will not take my exp date of Visa or Masercard. What am I doing wrong? I feel so sad I will miss this opportunity! Thanks for the beautiful free downloads. I printed them this evening and they are gorgeous. I follow your blog religiously and appreciate your fine talent. I love your wagon. Do you have any idea how big I could print this clearly at Costco? I would like to be able to print it at 16×20 for above my stove, but don’t know if it would be all blury. How darling Lucy you gals are so talented. Hi! How big do you think the wagoner can’t print? Thanks so much for this printable! It will have a special spot in my home. Thanks also for inspiring me! Just stopping by from Leah Every Day Love’s blog—and I am so happy she shared your page! It makes me all warm and fuzzy inside. 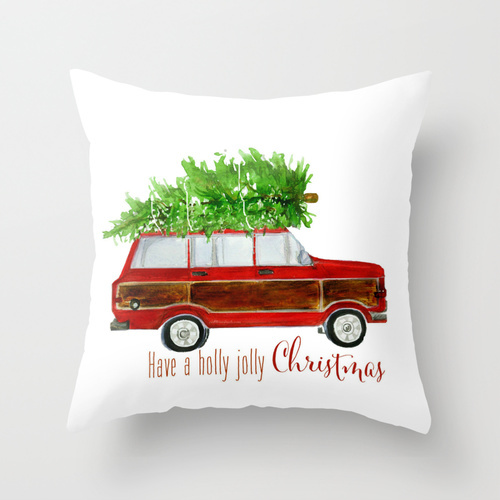 I cannot wait for the holidays this year, and you have such inspiring pieces! What a beautiful printable. Thank you so much. I am looking forward to placing it on my own mantle. It is disheartening to hear about the unethical behavior of others. Thank you so much. I came by looking for the xmas buggy that I had pinned, but saw that I could download this one. I have printed it and am going to stick it on my buffet as I am just starting to put out a few decorations. The kids are going to get a kick out of it! Thanks for your generosity. So beautiful! Thank you so much for sharing your incredibly beautiful art. I’m so sorry about the unfortunate “steal”. I just don’t understand that. Wishing you a blessed and happy holiday season! Eeeeeek! I needed this printable SO BAD for an upcoming part that I have coming up! Thank you so much for sharing! I pinned the printable above and am amazed how many more times it has been pinned. I have framed the print and everyone in my family has positive comments. Hi Lucy! I just found your website and blog and love it!! You are truly talented and your home is stunning. I used your free printable in my home and recently posted it and linked it back to your site so check it out! Hi, for all time i used to check weblog posts here in the early hours in the dawn, since i love to find out more and more. of the text on your posts are running off the screen. Can somebody else please comment and let me know if this is happening to them as well? These are just beautiful! I am doing a Christmas Printables round up over on my blog and would love to include some of these and link back to you! Let me know what you think! May I just say what a comfort to find somebody who actually knows what they’re talking about on the net. about. Now i’m very happy that I came across this during my search for something relating to this. Thank you so much for the lovely art!! You are so gifted!! !